This is amazing. It’s a powerful reminder of how much everyday Americans respect our servicemen & women, and those who made the ultimate sacrifice for our freedom. Coming short on the heels of news that actor Gary Sinise flew 1,000 children of fallen soldiers to Disney World for Christmas, we hear of an effort by American truckers to deliver almost 2 million wreaths to the gravesites of those who died while defending our nation. “Wreaths Across America (WAA) expects more than 1.8 million wreaths to be placed on the headstones of America’s heroes in more than 1,640 cemeteries nationwide during their upcoming WAA Day this Saturday. 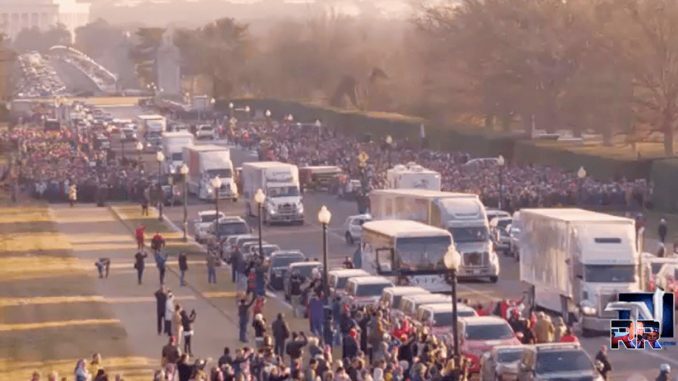 The epicenter of the entire patriotic spectacle is Arlington National Cemetery in Arlington, Virginia, where truckers will deliver 68 truckloads of wreaths. People from all over the U.S. will travel to Arlington to attend the annual event which honors those who have served in the United States Armed Forces. It has become one of the most treasured national days for veterans and proud Americans. Many of the family members of those who served will solemnly place a wreath on the headstones of the fallen while reverently speaking their name out loud. However, this remarkable display of love and honor on such a grand scale would not be possible without the generosity of truckers and the trucking community. “It just wouldn’t happen,” Rob Worcester, WAA Transportation & Logistics Coordinator, told Transportation Nation Network (TNN) in a recent interview featured in the latest episode of TNN’s original series show Truckerville. “The cost of doing this and actually paying to have these wreaths moved would be prohibitive. It just wouldn’t work,” Worcester said. 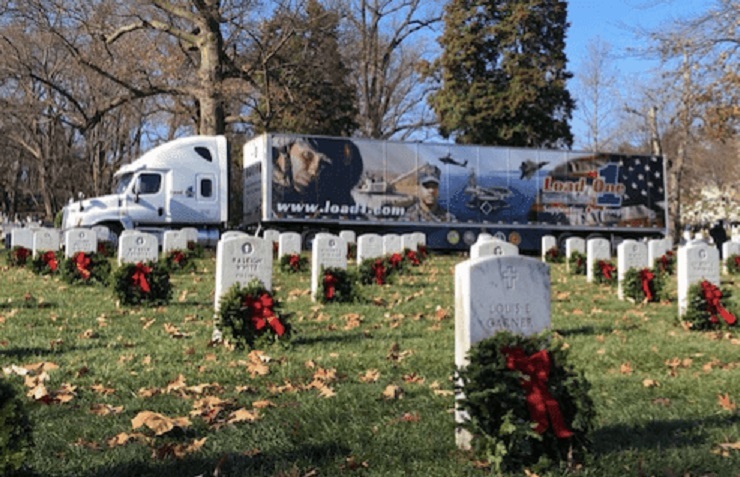 This year WAA tells TNN that approximately 265 trucking companies will be participating and truckers will deliver more than 450 loads of wreaths to cemeteries across the country. Trucking companies donate tractors, trailers, personnel, logistics expertise, fuel and many hours to help accomplish the mission which WAA says is to remember and honor the fallen, while also teaching future generations the importance of doing the same. Founder and C.E.O. of Load One, John Elliott, says 2018 marks ten years his company has partnered with and supported WAA. “Honoring and remembering those who sacrificed so much for our country and to protect our freedoms is an honor,” he told TNN. “Load One and its staff and drivers work to raise money, place wreaths and donate transportation for wreaths to be placed at Arlington National Cemetery and as well in our home state of Michigan. Those wreaths are without a doubt the most sacred loads we transport every year,” Elliott said. The newest episode of Truckerville, a TNN original series show, takes viewers behind the scenes of this remarkable event and shows you how trucker power makes all the difference. “Wreaths Across America is indebted to the transportation industry who not only helps move the mission, but does so with the utmost respect and appreciation for our veterans,” Karen Worcester, Executive Director of WAA, told us. When Trump was elected president, he vowed to bring honor back to those who have served, after years of Obama obliterating our military. President Trump followed through by revamping the Veterans Administration. Last month he announced that since his inauguration, his administration had removed over 3600 government employees who did not give our veterans the care they deserve. Over 2 million vets have been able to receive care outside of the much-troubled VA system since President Trump took office. It’s so important to remember those who have fought & died for us. And not just on Memorial & Veterans days. Those who perished protecting our freedoms have grieving families who are left behind. Mothers, fathers, wives, sons & daughters. They need to know that we respect their sacrifice and that we are there for them. It can be especially difficult for families of the fallen during Christmas & the holidays as they remember the loved ones they lost & the times they will never have with them again. Share this if you are proud of these truckers for honoring our fallen! This article originally appeared on rightwing.news & was used with permission & made better by Jeff.